Articles about the redevelopment of downtown Wichita and its impact on the economic freedom of Wichitans. After selecting a firm to assist with the planning for the revitalization of downtown Wichita, the city issued a press release that contains a mischaracterization of a Wichita institution. 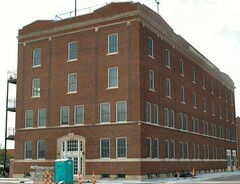 Here, the Wichita Downtown Development Corporation is classified as part of the private sector. It’s hard to see how this characterization makes any sense. The WDDC is organized as a 501(c)(3) tax-exempt non-profit corporation. But unlike most non-profits — which rely on voluntary contributions from those who support their causes — the WDDC is almost totally funded by a governmental body, the City of Wichita. In fact, nearly all the WDDC’s revenue comes from taxation. According to its IRS form 990 for 2008, the WDDC received $610,214 from its public improvement district, in the form of property taxes paid by downtown property owners. According to the form, this represents 98.320% of the WDDC’s revenue. So is the WDDC part of the “private sector?” Of course not. It is funded almost totally by government taxation. The City of Wichita calling WDDC “private sector” is like saying the Wichita public school district is private sector. You can’t blame the city for trying this sleight of hand. One of the big buzzwords we’re going to hear as part of the coming centralized government plan for downtown is the “public-private partnership.” We can expect the city to do everything it can to pump up the appearance of private sector buy-in to the planning process. This misleading characterization of the WDDC, I suspect, is just the start. This past Tuesday and Wednesday, the four planning firms that were selected as finalists for the master plan for the revitalization of downtown Wichita made their public presentations. I was able to attend three of the presentations. In his opening remarks to the Tuesday session, Wichita Mayor Carl Brewer said that tonight is an important night for our community. He said that the revitalization effort is about more than just downtown, but about all of us. “Downtown is our front porch.” We must come together as a community in this effort. Studies of other cities, he said, show that downtown revitalization leads to more jobs, tourism, increased property values, and increased satisfaction and pride in our city. “Feet on the street,” the mayor said, means that everything people want can be provided in a walkable area. Community engagement is important, all firms said. So is the public-private partnership. Leveraging public investment with private investment was always mentioned. Transit — including public transit — was emphasized by the firms. One firm promoted “bicycle-oriented development.” In a nod to the green revolution — whether that’s a good idea or not — “sustainability” was often mentioned, with one firm having an expert in just that on its panel of presenters. There was actually some distinction between the presenting forms. One makes use of a charrette, which is a period of intense design activity. Another firm said it doesn’t use this practice. For one firm, the presenter said that the firm had been in Wichita for three months gathering information and meeting with Wichitans. The presentations and the printed proposals are full of grand and attractive images of the firms’ projects in other cities. One firm, in its presentation, showed several images of parts of downtown Wichita where there was a vacant lot or other empty space. Then, said the presenter, imagine if it looked like this! And the empty space would be filled in with attractive buildings of immense size and scale. Sometimes the presenters said things that made me wonder about their actual knowledge of Wichita. One said that because Wichita has such a stable economy, it is attractive to outside investors. While it’s true that our housing market has been relatively stable — we never had the huge run-up in prices and then a crash — it a common compliant that Wichita is too dependent on aviation, and that we need to diversify our local economy. Another presenter, and I am not kidding, praised the WaterWalk development as an example of a Wichita success. I also learned that we must prepare — at least according to one firm — for the return of passenger rail service to Wichita. I was surprised that most of the planning firms used a variety of experts in different fields — economics and economic development, transit, planning, architecture, sustainability, civil engineering, traffic, and transit are some of the examples. One firm had partnered with local experts. Each firm presented for about an hour, with time for just a few questions from the selection committee. Going forward, the selection committee will select one firm to recommend to the Wichita city council. The target date for this is tomorrow. Then, it’s thought that on October 13 the city council will make the selection — or maybe choose none of the firms. Since the city council has the final say, I was surprised that only council member Lavonta Williams attended, besides, of course, Mayor Brewer. After the steering committee makes its recommendation, I plan to examine that firm’s proposal more closely. We also need to take a look at the results of their previous projects. For example, were they financed through tax increment financing (TIF) districts, and how are those districts performing? What other type of public subsidy was necessary to make the projects work (or not)? Was eminent domain used to transfer property from one person to another, just because the new owner would pay more in taxes? If there was rezoning, was it done with overlays that respected existing property use rights? These are some of the questions that we’ll want to get answers to. These are the important things I learned about during my trip to Anaheim’s Platinum Triangle development. Will Wichita pursue a freedom-friendly planning process as used there? In addition, we need to decide whether we want to plan at all, at least in the comprehensive way that the planning firms are promoting. A book I recently read, The Best-Laid Plans: How Government Planning Harms Your Quality of Life, Your Pocketbook, and Your Future, presents evidence of the harm that centralized government planning causes. Listening to the presentations, I recognized the firms were planning to use many of the dangerous practices and beliefs mentioned in this book. Downtown Wichita presentations: what’s the point? As part of its effort to revitalize downtown Wichita, the city wants to hire a planning firm. Four firms have been selected as finalists. Tuesday and Wednesday, (September 22 and 23), the firms will make public presentations as part of the selection process. In the end, the fact that the city won’t let citizens see the proposals probably doesn’t matter. At this week’s planning meetings, citizens will not be allowed to ask questions. There will be a city council meeting where the council will make a decision, and citizens will have an opportunity to provide input at that time. But without detailed knowledge of the proposals, how can citizens ask questions? Citizens need to realize that city government and downtown leaders are just not interested in their input in this matter. There are a few citizens, though, who do have these proposals. If you’re a member of a select committee, you can have them. Government shouldn’t be allowed to pick and choose which select citizens are allowed to see how their tax dollars are to be used. The fact that the city doesn’t want to let citizens — except those in a limited circle of downtown boosters — view these proposals and participate in the planning firm selection process is disturbing. It follows a pattern of stacking committees with people friendly to the desired goal, with no desire for dissent to be heard. It’s a public relations disaster for the City of Wichita. On the City of Wichita’s cable channel 7, Kansas City’s Power & Light District is presented as a model for the revitalization of downtown Wichita. Wichita Mayor Carl Brewer sees this district as Wichita’s competition. So yesterday I went to take a look for myself. And I agree with the mayor. It’s a neat place. It’s huge. It would be great if Wichita had something like it. But there are problems surfacing already. Although I haven’t yet done extensive research, it appears that the troubles stem from the public/private partnership nature of the district. In Wichita, when we have underperforming TIF districts, we might make an interest-free loan to solve the problem. 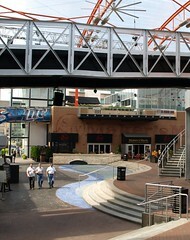 The developer of the Kansas City Power & Light District refers to the project on its Web site as an $850 million project. Yet The Cordish Co. claims in a lawsuit and to county officials that the project’s value — at least its appraised valuation — should be $12.3 million when the project is complete. In Wichita and across the country, public/private partnerships have a mixed record. We’ll want to think carefully whether we want to rely on the artificial nature of subsidized development as we think about the revitalization of downtown Wichita. As part of Wichita’s downtown revitalization effort, city leaders decided to hire a planning firm. Four firms have been selected as finalists, and a committee is in the process of evaluating their proposals. Whether or not you think this planning process is wise — and I happen to think it is not — it seems to be the will of the city and the special interest groups that will benefit from this type of central planning. So, it seems, we might as well make the best of it. This would include selecting a planning firm that seems most likely to respect property rights, specifically: (a) rejecting the use of eminent domain to seize property, (b) respecting existing zoning and land use rights, and (c) rejecting the use of TIF districts and other forms of public subsidy. These are the things that I learned are important from my trip to Anaheim’s Platinum Triangle, if a city wants to plan in a freedom-friendly way. On September 22 and 23, the planning firms will be making presentations to the public. I thought it would be great for citizens to be able to read the proposals so that they would be able to ask intelligent questions at these presentations. Unfortunately, the city won’t let citizens read these proposals, and citizens will not be permitted to ask questions at the presentations. The City of Wichita, according to Scott Knebel (Principal Planner, Advanced Plans Division, Wichita-Sedgwick County Metropolitan Area Planning Department), doesn’t consider the proposals to be open records under the Kansas Open Records Act. He wrote that in response to my informal request to view the proposal documents. I’ve now made a formal request to the city, and if the city denies access to the records, it will have to cite the provision in the Kansas Open Records Act on which it is relying. Earlier I said that citizens can’t read these proposals, but that’s not entirely true. If you’re a member of a select committee, you can have them. Government shouldn’t be allowed to pick and choose which select citizens are allowed to see how their tax dollars are to be used, and all citizens have a right to know if government intends to take their property. The fact that the city doesn’t want to let citizens — except those in a limited circle of downtown boosters — view these proposals and participate in the planning firm selection process is disturbing. It follows a pattern of stacking committees with people friendly to the desired goal, with no desire for dissent to be heard. At yesterday’s meeting of the the Wichita City Council, a matter was presented to the council that provided an illustration of basic economic principles that are foreign to the council. A condominium homeowners association asked for special assessment tax financing to make repairs to the building. My remarks that I delivered at the meeting were based on my post In Wichita, waiving guidelines makes for bad policy. David M. Bryan, a Wichita attorney and resident of the building, represented the the homeowners association that is asking for the special assessment financing. He spoke after I did. His wife accompanied him to the podium. Bryan’s case for help was based on factors that — besides being irrelevant — show just what a fiasco this matter is. It also illustrates just how selfish these condominium owners are in expecting the city to bail them out of their problem. First, he says that he and the other condo owners represent one of the goals of downtown redevelopment. “We all took that leap of faith and bought the lofts” when the building was still under construction. He didn’t know what tuckpointing was when he moved in to this building, and he and the other residents didn’t know that this [the need for repair] was going to happen. He said that he thinks the building represents a sound and good investment in downtown redevelopment, and that the building is part of what the city council wants to accomplish. Conventional financing for these repairs would, Bryan said, require personal guarantees by all residents, and that would prevent the individual units from being sold unless the entire loan was paid off. Council member Paul Gray, speaking from the bench, expressed concern that approval of this request sets a precedent for other condominium buildings in Wichita to make the same request that this building has made. In the end, council member Lavonta Williams made the motion to approve the financing. All members except Gray voted for it. Vice-Mayor Jim Skelton was not present. After the council voted, Mrs. Bryan gave Wichita economic development director Allen Bell a pat on the back, and Bell and Mr. Bryan shared a congratulatory handshake. You can see these things by attending the meetings in person. It appears that the city’s desire for downtown redevelopment is an unsustainable goal that can’t be maintained without continued subsidy. The message is this: When a downtown development gets in financial trouble, make a beeline to city hall. This was the case last year when the Warren Theater received a no- and low-interest loan from the city, propping up the city’s ill-conceived investment in a TIF district benefiting that theater. Recently we learned that rehabilitation of a downtown hotel is on hold because historic tax credits — that is, outright gifts to developers — are on hold because the state can’t afford to grant them. Now, buildings that need small repairs that can be deemed to be part of the city’s plan for downtown redevelopment are eligible for special assessment financing. I don’t think the council is aware of the corrosive effect of these special favors. No news media reported this story. It is a small amount of money that is involved in this case. This matter is emblematic, however, of an activist city council and city staff who believe they can direct economic investment in Wichita better than its citizens can on their own. Economics is haunted by more fallacies than any other study known to man. This is no accident. The inherent difficulties of the subject would be great enough in any case, but they are multiplied a thousandfold by a factor that is insignificant in, say, physics, mathematics, or medicine — the special pleading of selfish interests. In addition to these endless pleadings of self-interest, there is a second main factor that spawns new economic fallacies every day. This is the persistent tendency of men to see only the immediate effects of a given policy, or its effects only on a special group, and to neglect to inquire what the long-run effects of that policy will be not only on that special group but on all groups. Remarks to be delivered to the August 18, 2009 meeting of the Wichita City Council. I am here to ask you to deny the request for special assessment financing for the Lofts at St. Francis homeowners association to make repairs to their building. I’ve spoken to this council about how the facade improvement program, in general, is bad public policy. In this case, it’s bad public policy compounded by the waiver of principles or guidelines that this council recently set in place. I realize that special assessment financing means that the city is not making a grant of money to the homeowners association. Instead, the city is making a loan, which is required to be repaid over time. What concerns me about this situation is that two guidelines in the city’s facade improvement program must be waived for this project to obtain special assessment financing. The first is the private investment match. This is designed to ensure that the property owners have “skin in the game” and that the taxes will be paid back. Here, the city is proposing that since the building’s owners have made a past investment in this property, there’s no need to require a concurrent investment. It hardly needs to be noted that anyone who has purchased property has made a past investment in that property. So the city proposes to waive this requirement as well. There seems to me to be a defect in the manner of ownership of this building. While the homeowners association and the individual condominium owners might not have anticipated that repairs would be needed so soon after the building’s opening, they must have contemplated that repairs and maintenance — to either exterior or interior common areas — would be needed at some time. How does the association plan to pay for these? Isn’t that what private property owners do: fund the cost of repairs to their property? According to the Sedgwick County Treasurer’s office, the appraised values of these condos range from $103,000 to $310,200, with an average value of $201,943. The maximum amount being added to each condo’s assessment is $4,022, although I have learned that the actual amount may be closer to $3,000. That’s along the lines of what it might cost to perform a few repairs and paint a house that’s worth what these condos are worth. So I think it’s hard to make the case that these property owners can’t afford to make these repairs on their own without a loan from the city. Furthermore, if the goal of the facade improvement program is to provide an incentive for property owners to fix up their buildings, I would submit that such incentive is not necessary in this case. This building is a valuable residential property, and the homeowners have a strong incentive to maintain the integrity and value of their property. Mr. Mayor and members of the council, let’s ask these owners do just what thousands of homeowners in Wichita do every year: take responsibility for the maintenance of their own property without looking to city hall for help. At Tuesday’s meeting of the Wichita City Council, a privately-owned condominium association is seeking special assessment financing to make repairs to its building. In order for the association to succeed in its request, the council will have to waive two guidelines of Wichita’s facade improvement program. So the city is not giving this money to the building’s owners. They’ll have to pay it back. The city is, however, setting new precedent in this action. Special assessment financing has traditionally been used to fund infrastructure such as streets and sewers, and new infrastructure at that. The city, under its facade improvement program, now allows this type of financing to be used to make repairs and renovations to existing buildings. That’s if the building is located in one of the politically-favored areas of town. By using special assessment financing in this way, the city seeks to direct investment towards parts of town that it feels doesn’t have enough investment. This form of centralized government planning is bad public policy. The city should stop doing this, and let people freely choose where to invest. Besides this, two guidelines in the city’s facade improvement program must be waived for this project to obtain special assessment financing. There seems to me to be a defect in the manner of ownership of this building. While the homeowners association and the condominium owners might not have anticipated that repairs would be needed so soon after the building’s opening, they must have contemplated that repairs and maintenance — to either exterior or interior common areas — would be needed at some time. How does the association plan to pay for these? According to the Sedgwick County Treasurer’s office, the appraised values of these condos range from $103,000 to $310,200, with an average value of $201,943. The maximum amount being added to each condo’s assessment is $4,022, although the actual amount may be closer to $3,000. That’s along the lines of what it might cost to perform a few repairs and paint a house that’s worth what these condos are worth. Let’s ask that these owners do just what thousands of homeowners in Wichita do every year: take responsibility for the maintenance of their own property without looking to city hall for help. Bob Weeks discusses planning for downtown Wichita revitalization and what he learned on his trip to the Platinum Triangle in Anaheim, California. Host Tim Brown and guest Randy Brown also appear. From the KPTS Television show Kansas Week, August 14, 2009. The article referred to is Wichita’s getting ready to plan. As the City of Wichita develops a grand plan for downtown revitalization, can we have a process that is freedom-friendly and respects property rights? I went to Anaheim to find out. Leaders in Wichita — both private and public sector — believe that Wichita needs a plan for downtown. To support this, the city is seeking to develop a Downtown Revitalization Master Plan, a “a twenty-year vision for its thriving downtown.” Right away I want to ask: if downtown is thriving, why does it need revitalization? The danger we face is that Wichita’s plan will end up like almost all other urban plans — a top-down effort micromanaged by politicians and bureaucrats, people whose incentives are all wrong. We already have the structure in place, with our mayor promoting the plan for downtown as his signature achievement, and a tax-supported downtown development organization headed by a young and energetic planning professional. There is a different way to go about redevelopment, a way that respects freedom and property rights, while at the same time promising a better chance of success. No use of eminent domain to take property. The forceful taking of property by government for the purposes of giving it to someone else is one of the worst violations of property rights and liberty that we can imagine. But it’s a prime tool of redevelopment, one that the planning profession says is essential to their efforts to reshape cities. In Kansas, we have a relatively new eminent domain law that, on its face, should provide strong protection to property owners. It’s unknown whether this protection will be effective when a city such as Wichita asks the legislature to allow the use of eminent domain, which is what the law requires. If a city makes the case that the success of Wichita and thousands of jobs depend on the use of eminent domain, will legislators go along? Overlay zoning that respects existing land use. Instead of replacing existing zoning, the city added an “overlay zone.” This meant that while the land had new permissible uses and restrictions, existing rights were protected. It’s only if existing property owners wanted to pursue new development that they would have to conform to the new development standards contained in the overlay zoning. No public subsidies or incentives. In California, they’re called redevelopment districts. In Kansas, we call them tax increment financing or TIF districts. In either case, this mechanism allows property owners to, in effect, retain their own increased property taxes for the benefit of their developments, something that the average taxpayer — or real estate developer not working in a politically-favored area — can’t do. The City of Wichita views TIF districts as a powerful tool for development. The city has many existing TIF districts, and we can expect that others will be created to support downtown revitalization. While many people recognize and agree that the taking of land through eminent domain for economic development is bad, the taking of tax revenues through TIF is subtle. Most citizens don’t know this is happening. Anaheim did a few other things: it streamlined the permitting process, reduced parking regulation, developed a broad-based environment impact report, and relaxed requirements for balancing commercial and residential uses. It also used a “first-come, first served” housing permit allocation process. Instead of allocating housing permits to each parcel, permits were allocated to a much larger district. Developers could claim them through a competitive process and use them flexibly. What’s been the result in the Platinum Triangle? After the district was formed in 2004, development started at a fast pace. But the housing crisis in California has definitely put a damper on the pace of development. An illustration: In a loft project in the Platinum Triangle, condos originally priced at $400,000 are now offered at $250,000. It’s expected that as the housing crisis eases, developers will go ahead with their plans. The Platinum Triangle offers a distinctly different model for redevelopment than that practiced in most cities. A few other cities in California have noticed and are adopting Platinum Triangle-style, freedom-friendly, principles. The question we in Wichita now face is this: Will Wichita adopt a freedom-friendly approach to downtown revitalization?